One of my favorite dishes at Yo Sushi! is called Popcorn Shrimp Tempura. I tried it once and after that I was hooked! The delicate little shrimp are fried in a tempura batter and served with a swirl of miso sauce. It is so yum! It’s one of Josh’s favorite to so I decided to have a go at making this at home! First things first! The prawn tempura! 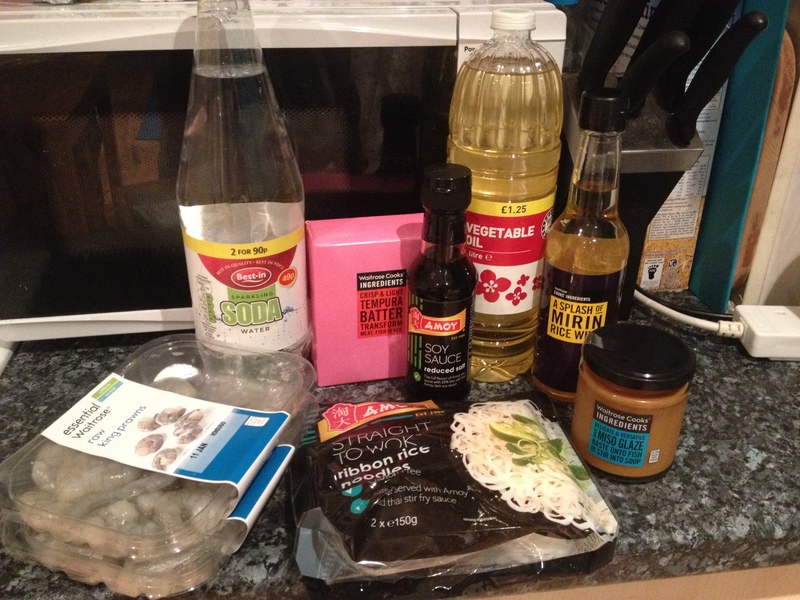 I bought a tempura batter mix from Waitrose (although I’m sure it’s available at other stores too – I just happened to see it while I was there!) 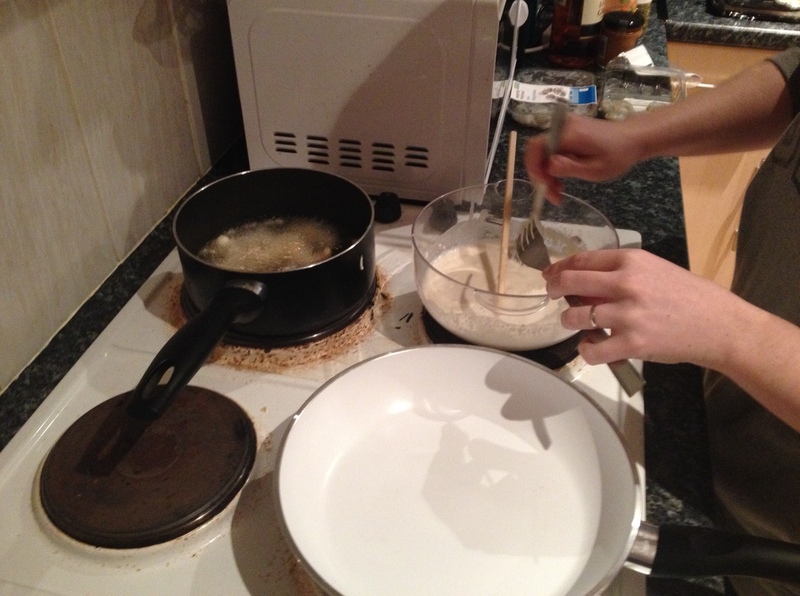 and added sparkling water to it to make a nice thick, bubbly batter. I made the batter too thick to start with and it was a nightmare to pick up so I had to add an extra dash of sparkling water to thin it down a bit. I think its a bit like making icing out of icing sugar though – too much water and all the batter will slide straight off the prawns! 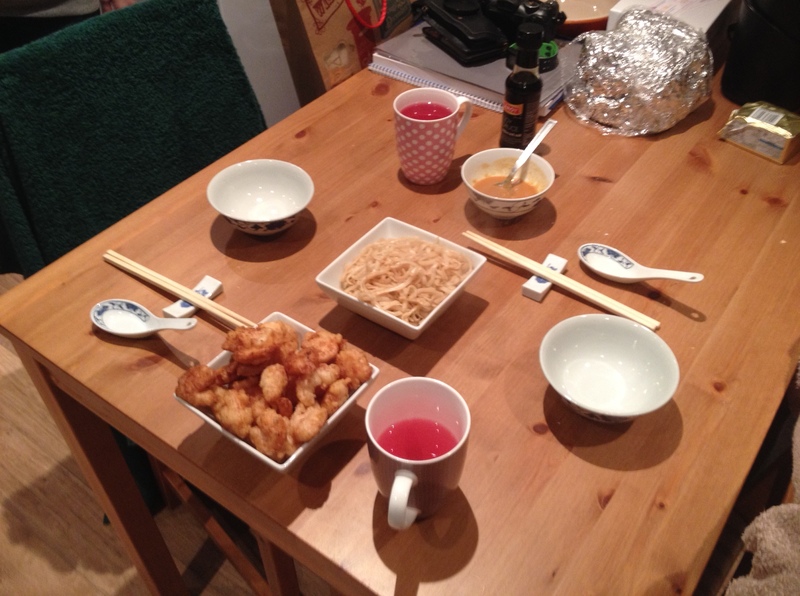 I used forks to handle the raw prawns – I just don’t like to touch them!! But its probably a safer way of handling them with all that hot oil. The oil needs to be nice and hot – a good way of testing is to add a small piece of white bread to the oil. If it sinks to the bottom the oil isn’t hot enough, if it burns quickly you need to turn the oil off for a few minutes and let it cool. The bread should skit across the surface of the oil. 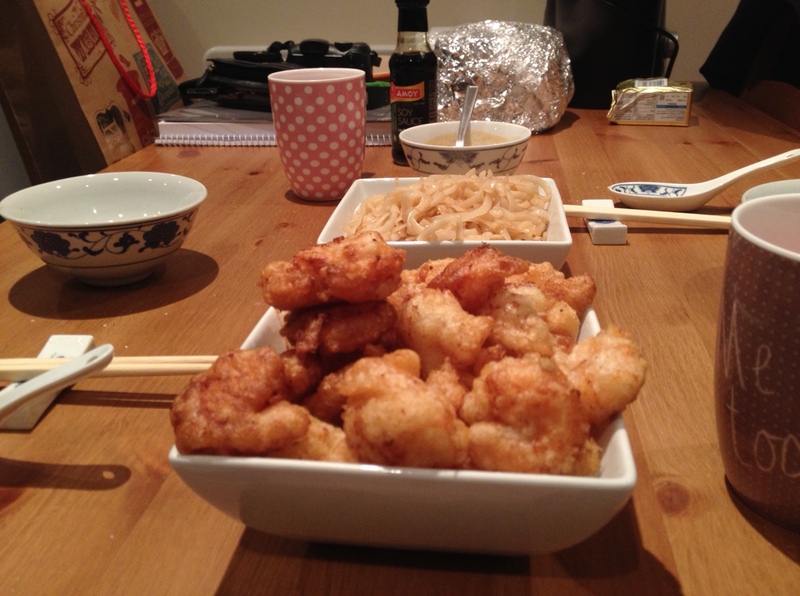 I coated the prawns, a few at a time, in the tempura batter and then dropped them into the oil. 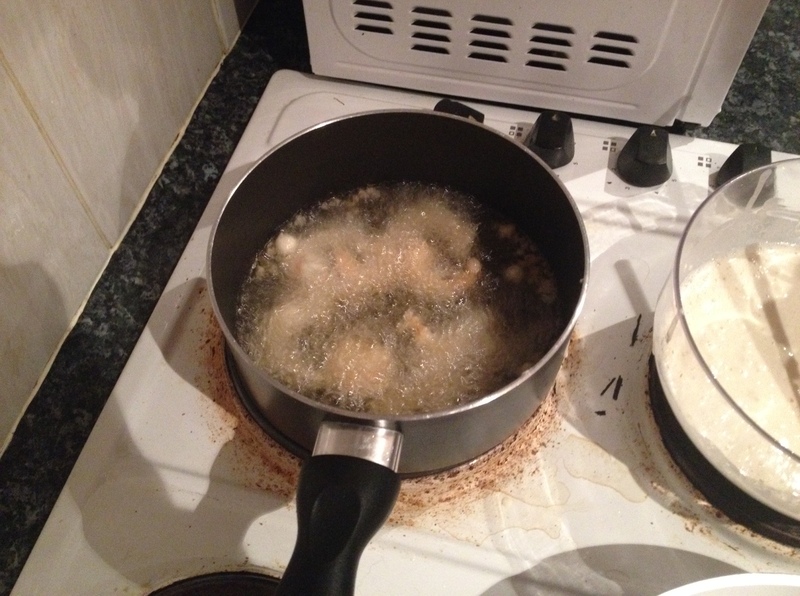 It takes a bit of trial and error with frying – I’m not sure what temperature the oil was at because I don’t have thermometer but if the oil gets too hot the batter will fry and cook before the prawns are done! Check the prawns and make sure they are done all the way through. Mine took about 4-5 minutes and my prawns were fairly small so were cooked right the way through. 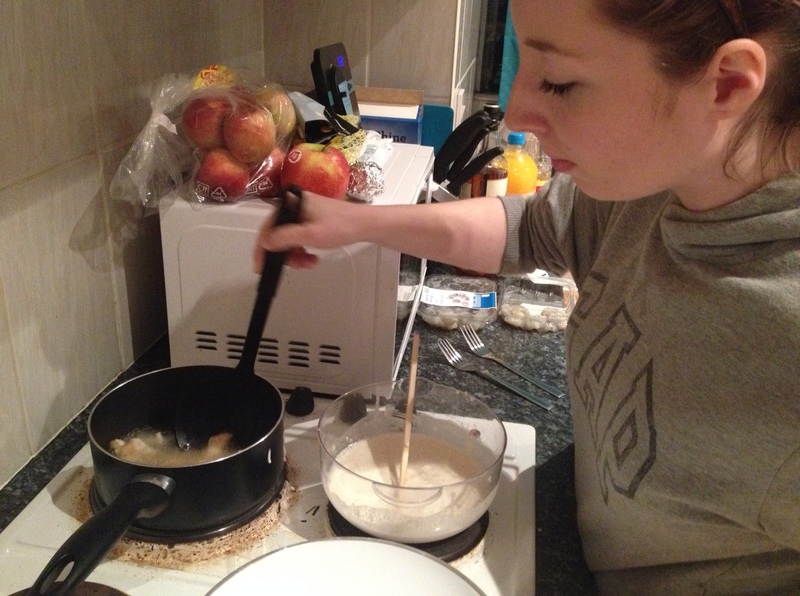 Turn them over occasionally with a slotted spoon or chop sticks, so they get a good cooking on each side. For the noodles, I used straight to wok noodles (I know lazy!) but added a dash of soy sauce and a dash of mirin while they were cooking to give them a nice flavor. For the miso sauce, I took a couple of table spoons of miso glaze (from waitrose again) and thinned it with a teaspoon of water. This made it more of a dip because the glaze was quite thick. So there you have it! I’m not going to write a recipe up for this one – because I really was kind of winging it! And I have no temperatures or anything for people to follow! But it was delicious so I thought I’d share. Have you ever enjoyed something in a restaurant so much you wanted to give it a try at home? What dishes have you tried to re-create? Hi there, when I first read the title of the blog I assumed you were mixing together the prawns, noodles and miso glaze to make a noodle dish! I also love the popcorn shrimp from Yo Sushi! and have been looking all over the internet to find a recipe of it worth trying! I luckily came across your blog and this recipe looks great, I was just wondering, do you think its worth watering down the miso glaze some more so that it can be all mixed together as a noodle dish? Or do you think the miso glaze as a sauce on its own would be too sickly? I actually asked them once what goes in that miso glaze, and if I recall correctly the answer was mayonnaise, miso, sriracha, and plain sugar!